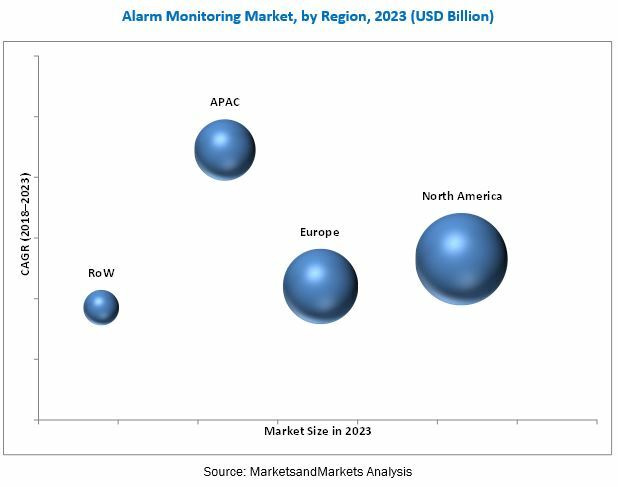 [132 Pages Report] The overall alarm monitoring market was valued at USD 42.88 Billion in 2017 and is expected to reach USD 59.83 Billion by 2023, at a CAGR of 5.5% during the forecast period. The base year considered for the study is 2017, and the forecast period is between 2018 and 2023. This research study involves the use of extensive secondary sources, directories, and databases (such as annual reports, press releases, journals, company websites, and paid databases) to identify and collect information useful for this study. The entire procedure includes the study of the financial reports of the top market players. After arriving at the overall market size, the total market has been split into several segments and subsegments and confirmed with key industry experts such as CEOs, VPs, directors, and marketing executives. The figure below shows the breakdown of the primaries. 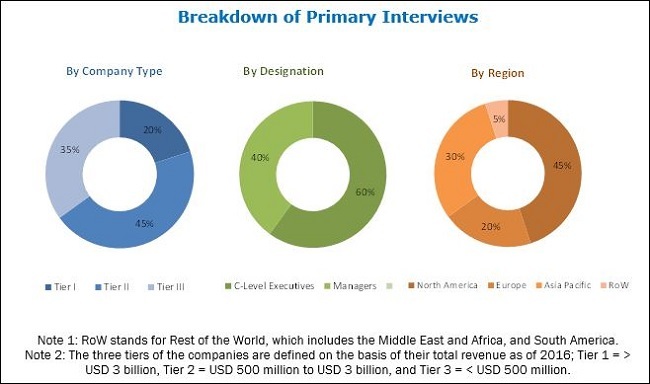 The key players operating in the alarm monitoring market include ADT (US), Moni (US), Honeywell (US), Securitas (Sweden), UTC (US), Schneider (France), Johnson Controls (US), Vivint (US), Vector Security (US), Bosch (Germany). The overall alarm monitoring market is expected to be valued at USD 45.70 Billion in 2018 and is likely to reach USD 59.83 Billion by 2023, at a CAGR 5.5% between 2018 and 2023. The major factors driving the growth of the alarm monitoring market include attractive insurance policy discounts for installing security systems and increasing popularity of smart homes and home automation systems. Software, services, and solutions held a major share of the overall alarm monitoring market in 2017. The software, services, and solutions segment dominates the alarm monitoring market as most players in this market generate revenues through monitoring and installation fees, which they obtain as monthly recurring charges. Many players in this market offer free equipment and installation to expand their customer base. Among all communication technologies, wired telecommunication network held the largest share of the overall alarm monitoring market in 2017. Wired telecommunication is the most commonly used communication technology in the existing alarm monitoring systems; its reliability is a major reason of its dominating presence. Among all end-use applications, building alarm monitoring held the largest share of the overall alarm monitoring market in 2017. Alarm monitoring systems installed in buildings are designed to detect emergency situations such as fire, smoke, intrusion, and flood. Residential buildings form a major segment of the alarm monitoring market for building alarm monitoring; a major part of the overall revenue in this segment is generated through monthly recurring charges, which alarm monitoring companies obtain in lieu of monitoring services. Most companies catering to residential customers do not charge for the equipment or installation costs; however; they charge a monthly fee for monitoring. North America is in the forefront in the evolution and development of alarm monitoring technology as this region is home to some of the largest multinational corporations in the world. Most leading players operating in the global alarm monitoring market are based in this region. Increased R&D in the field of remote monitoring, home automation systems, and Internet of Things, in terms of new and improved technologies, is a major factor driving market growth in North America. The emerging R&D activities at the academic and industry levels are broadening the application areas of alarm monitoring to include equipment monitoring, building alarm monitoring, environment monitoring, and medical equipment monitoring in North America. The market in APAC is expected to grow at the highest rate between 2018 and 2023 as the region is highly concerned about the increase in security spending owing to the ever-growing threat landscape in the region. In the recent years, APAC has undergone tremendous economic growth, political transformations, and social changes. Some of the major players operating in the alarm monitoring market are ADT (US), Moni (US), Honeywell US), Securitas (Sweden), UTC (US), Schneider (France), Johnson Controls (US), Vivint (US), Vector Security (US), and Bosch (Germany).